School. Met Phil at 2.45 & we went & had coffee together till 3.30. Then I went to see Pollock. He wanted to know if I’d do a child’s book of the Zoo! He asked me to meet him at Victoria tomorrow to go to the zoo. I said I would. Home at 5. Read. Went down to see Jessie Glover’s jumper & bought a lovely Viennese one. Jock came in & we played bridge. 'Phil' is Phyllis Chase who had been Enid's partner in creativity since 1920. Their first joint project had been for one of Cassell's weekly magazines for which Phyllis had already done some work. 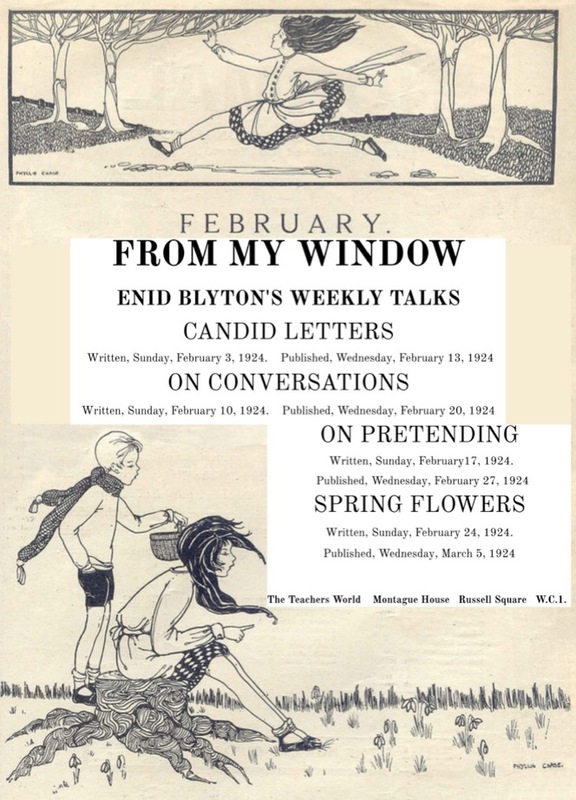 Phyllis also introduced Enid to Birn Bros and to J. Savillle, the publisher which brought out a book of poems by Enid in 1922, the cover being drawn by Phyllis. But it was Enid who introduced Phyllis to her editor at Teachers World and for two years now Phyllis had been illustrating Enid's poems and stories, as well as other contributors' copy on the 'A Number of Things' page. Shopped with Mums. Met Hugh at 2. Went to zoo, & looked round. Taxied to Piccadilly Restaurant & had tea at talked till 6! He was very nice. We’re going to try and be real friends and not fall in love! No yet, at any rate. We are going to meet again tomorrow. Home at 7. Bridge till bed. Mr Little came to supper. Wrote all a.m. Met Hugh at 2.45 at Piccadilly. We went to the park at walked till 4. Then to the Piccadilly Restaurant for tea & talked till 6.15. We’re going to have a purely platonic friendship for 3 months, then see how we stand! Oh dear. Home at 7. To bed early. After a four-hour meeting on Saturday, the L. word is mentioned. And after nearly as long a meeting on Sunday, the S. act is alluded to. Swift work, Enid, who, as far as Phyllis Chase knew (she was asked by Barbara Stoney about this in 1971), had not even had a boyfriend before. I wonder where Enid would be when she received letters from children. At Southernhay or at the house on Oakwood Avenue? The latter, I presume. The day of the week poems appeared once a month and ended in January. The one for Thursday appeared in October 1923 and is about a schoolgirl having a very bad day! ‘When Thursday comes it seems to me the week’s been very long. And always on that day I get my sums all wrong. And when I try to listen hard to what my teachers say. My thoughts turn round inside my head and go another way. ‘My mouth keeps yawning by itself, and that’s most impolite. But I can’t seem to stop it, though I shut my lips up tight. Enid making use of her teaching experience, but one can see how a child might be uncomfortable reading it. Who was Peggy Haines? Even Google can’t help with this. Last thought on this latest Talk, I think what's emerging is precious. To be given the right of entering into the domain of young Enid's soul. To Surbiton. School. May is away because Sandy has measles. Mollie’s music. Wrote & did rug till bed. I guess those are the names of two more children in Enid's class. Oh, lucky boys and girls! - measles quarantine notwithstanding. School. Handwork till 4. Wrote all evening. Letter from Hugh. He says he is fond of me in a big brotherly sort of way!! I’ll small sister him. During the First World War, Hugh was in the Royal Scots Fusiliers. And after that he joined the Indian Army, serving in both India and Burma. Perhaps he had been talking to Enid about India. That might explain the following poem, written by a young woman who had only ever been out of the country to France. In other words, Enid can write imaginatively as well as she can record her own experience. The progression from dawn to dusk in a south London garden or on the Indian sub-continent. She knows one and has been told about the other. So she can imagine the latter almost as well as she can describe the former? You decide. 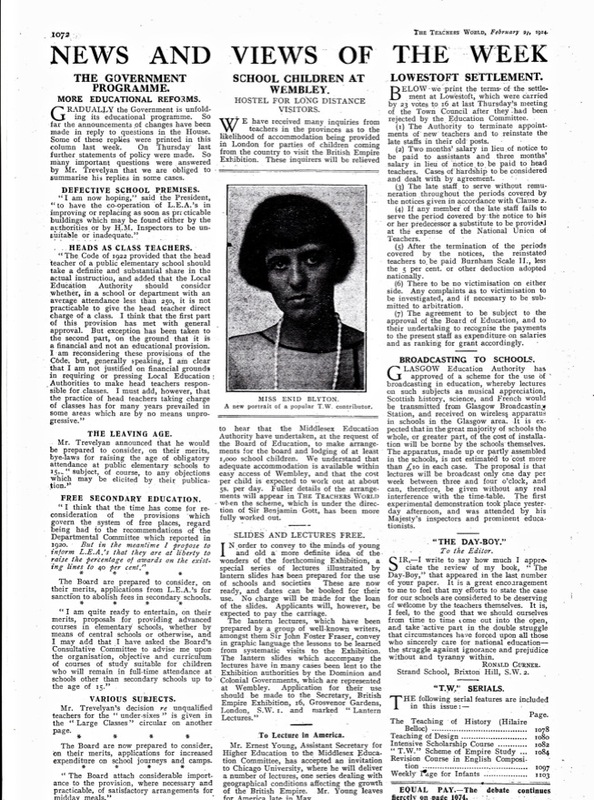 A series of full-page poems about foreign lands took over from the full-page poems about days of the week in the extra number of Teachers World that came out on the first Friday in the month. So the above poem about India appeared on March 7. School. Painting till 4. Wrote letters etc. till 7. Wrote a long letter to Hugh till 9 telling him exactly what I think. Guess he won’t like it much, but he’s going to fall in love if he hasn’t already. I want him for mine. What are we to make of Enid's frank remarks re Hugh Pollock? She wants more than a platonic relationship, but he must lead the way. She intends to pull the strings, but it mustn't appear that way. But what did Enid write before the letter to Hugh? There is an unusual entry in her work log, which states '3 P.C. Ideas.' Usually, if Enid wrote a poem, she noted the number of verses, and if she wrote a story, the number of words. This entry suggests she worked at 3 P.C. ideas, whatever P.C stands for. School. Mollie’s music till 4. Wrote & thought all p.m. Hugh phoned up at 6.45. He’d got my letter. He wants to seem me on Saturday. He sounded as if he’d got a rotten cold. I’m glad I’m going to see him so soon. Hugh's fragile health would always be an issue. In the work log there is the second of two odd entries. This time it reads '4 P.C. Ideas'. Oh, I get it. It's Phyllis Chase. On Wednesday, Enid worked on 3 Phyllis Chase ideas and on Thursday four. This could refer to the Indian poem that was completed on the Tuesday, for by the time it appeared in Teachers World it was surrounded by sketches of Indian life that Phyllis may have had to be closely briefed on. School. Met Phil at 2.45 & had tea at Corner House. Told her about Hugh. She was ripping to me. She thinks I’m doing the quite right to make things difficult for him. Saw Mr Allen at 4.30. He is thrilled with the Indian poem. He introduced me to Eric Evans who has volunteered to take me round the zoo any time I like! Home at 7. Read till bed. V. tired. Lyons had two or three large Corner Houses in London at this time. I've marked two of them on the map as well. See the turquoise circles. 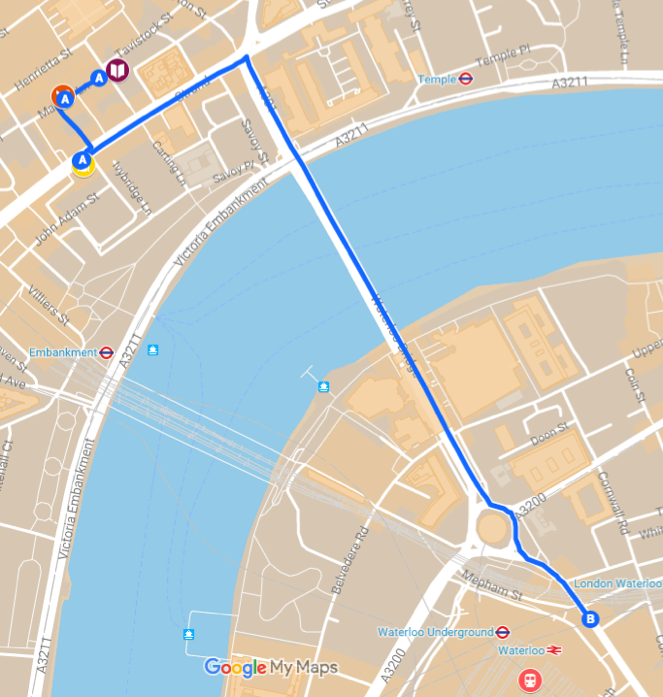 They are a fair distance south from Russell Square and the location of Teachers World. Nevertheless, their location would come in very handy as we'll see. 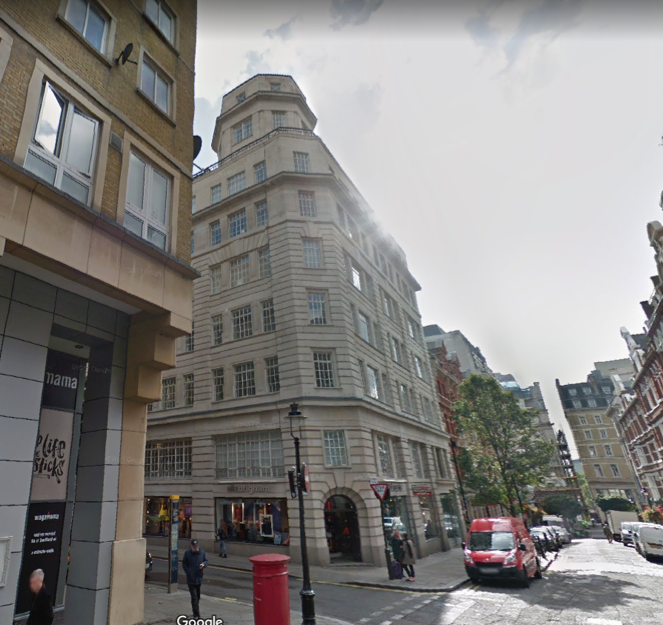 I've also marked The Piccadilly Restaurant (approximate location) where Enid and Hugh had already eaten twice by this time and Rules Restaurant (exact location) where they would go on to eat quite often. 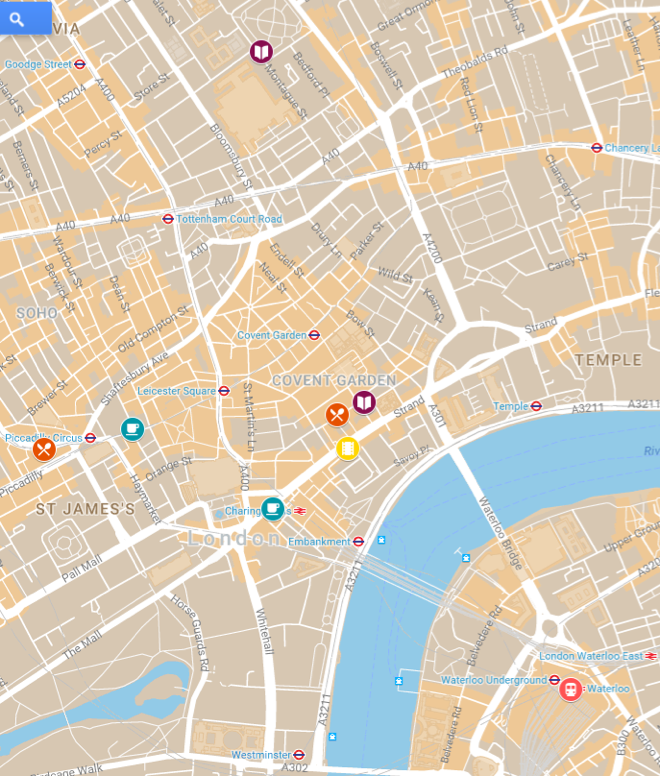 Oh, and Tivoli's the cinema (yellow circle) on The Strand. 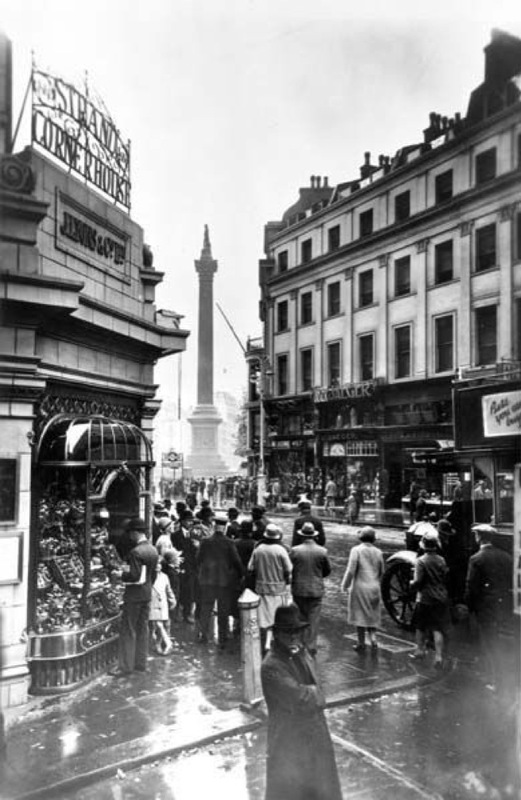 Oh, and George Newnes Ltd on Southampton Street, just off the Strand. Particularly handy for Hugh to nip out of work and meet Enid at Rules or the Tivoli. Waterloo is the red circle at the bottom of the map, but when coming in from Beckenham, Victoria was the mainline station she would arrive at, which is off the map, bottom left. But lets not get too literal here. Before the business meeting, Enid enjoyed a nice long meeting at Corner House with her friend and collaborator, Phyllis Chase. Let's say it was the one off the Strand, close to Trafalgar Square. Which you can see on the left of this historic photo. But the thing about a Lyons Corner House was it transported you. I'm sure Enid and Phil had no problem relaxing over their cuppa, imagining themselves in a leafy glade, or indeed Indian setting. 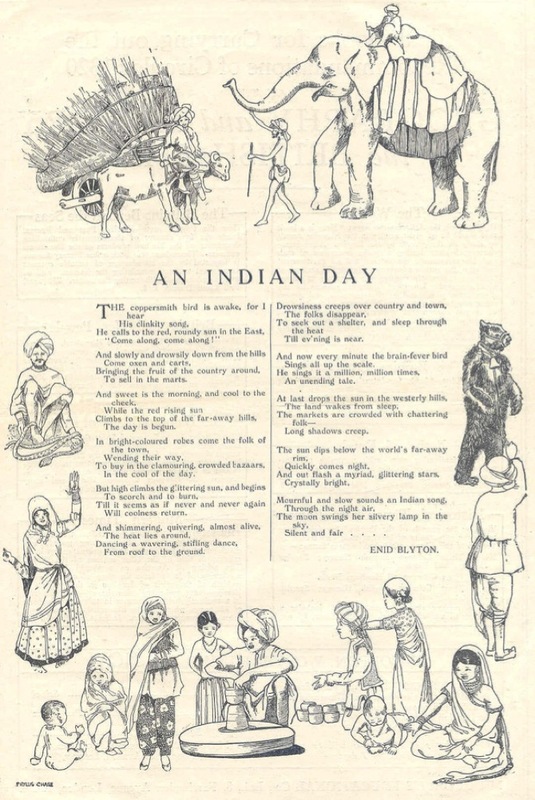 Becasue Enid would have taken the opportunity to communicate her ideas about what was needed by way of illustration for 'An Indian Day'. After that, the girls of St Christopher's could relax. Perhaps part of the conversation about Hugh was conducted through the nursery rhymes that Enid had written in January and which appeared one at a time in weekly issues of Teachers World in February, on the 'A Number of Things' page, accompanied by Phyllis's drawings. Phil: "As far as Hugh's concerned, I think you must try and do better than MIss Muffitt." And frightened the poor girl away." Enid: "I fancy I will do better than her. And that I won't let Hugh do a Jack Horner on me." And said ‘What a good boy am I.'" Phil: "Just don't get too clever." Enid: "It's so hard for me not to do exactly that." Phil: "I know it is, darling. As the headmistress at St Christopher's never tired of saying to us in assembly, "There is a girl currently at this school who is going to set the Thames on fire." Phil: "I don't think she ever mentioned the Ganges, but I might be wrong." Met Hugh at Victoria at 10. Went to Newnes & he gave me the stuff for B[?]. Then we went & sat by the fire at Rules & had lunch there. Then we went to see the covered wagon film. It was lovely. Tea at Corner House. Then to Victoria & missed my train so we had dinner there. He saw me off by 10 train. I know he loves me but I’m not going to say I love him till he has proved himself. He is a dear & a darling. Prove himself? I think Hugh has to prove that he loves Enid. Or that he deserves her love in some other way. But how does the dear darling do those things, exactly? 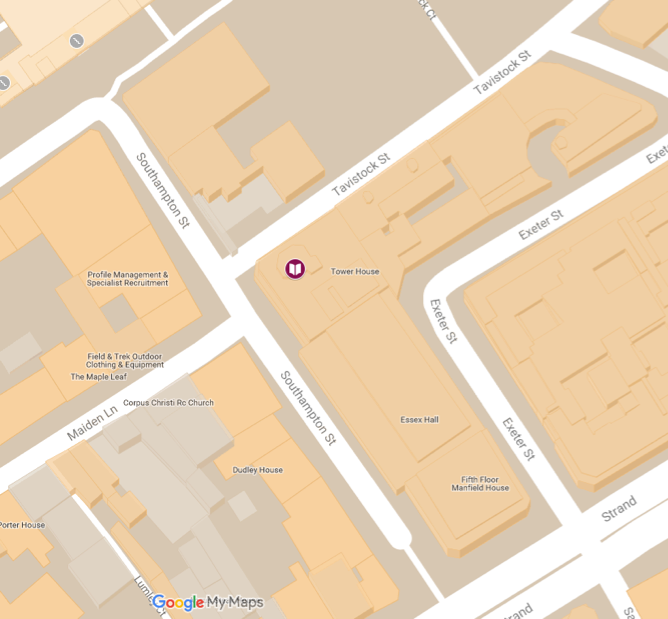 The map below shows the location of George Newnes Limited, where Hugh Pollock worked as its books editor. Below is a present day view of Tower House as one walks south along Southampton Street towards the Strand in the distance. AsI say, by the time Newnes was publishing The Enchanted Wood and Adventures of the Wishing-Chair in the late Thirties, Tower House, Southampton Street was stated as the address on the preliminary pages. But in 1924 it was simply 'Southampton Street'. Perhaps all these authors and books were talked about that day. Either in Hugh's office, or by the fire as they had lunch in Rules, or at the Corner House after watching the Western, or over dinner at Victoria having missed the early evening train back to Beckenham. How wonderful to have a prospective boyfriend who was the books editor at Newnes. A sophisticated, attractive older man, who had done great things for the country as a soldier and was now publishing ripping books. Simply fantastic for a simple country girl! like Enid! Read all a.m. Read & thought till tea. Chapel in p.m. with Mums. Read till bed. That reads like a manifesto. Enid Blyton is going to be a writer not a talker. The luminous thoughts and repartee are not going to go into her talk but into her Talks. Many writers feel similarly about the relative merits or their own speaking as opposed to their writing. But not all. Interesting that Enid (though she's clearly not that interested in politics) places herself on the side of the Labour Party. Ramsey MacDonald was Prime Minister for most of 1924, being preceded and succeeded by the Tory, Stanley Baldwin. There is a diary entry, I think in 1932, where Enid writes, 'A socialist landslide, thank goodness', which seems to confirm her political allegiance when she was young. As for gender politics, of course it's the man who likes the sound of his own voice, not the woman. While it's never been true that all men are bores, most bores are men. It's true now, and would have been all the more so back in 1924 when women had not long been given the vote and the patriarchy was in full swing. More of which later. As for not being good at repartee, is Enid forgetting her chats with Phil in Lyon's Corner House? And I'm pretty sure she would have been pretty damn witty while in Hugh's company on Saturday, just the day before. Yes, there's hope for Enid yet as an all-round entertainer! But a writer first and foremost? Oh yes, we think so. To Surbiton. School. Mollie’s music till 4. Wrote till bed. Enid's work log tells us that she began the second of her books for Dr Wilson at Nelson's this day. As with Brer Rabbit, Nelson already published a version of Aesop's Fables, so Enid would have had that to work from. Anyway, she knocked off six fables and 1600 words. What great experience for the young writer to be doing such an exercise, with the work of a writer from classical Greek times, so soon after having worked with animal stories that emerged from post-slave trade America. School. Handwork till 4. Tea at Sayers. Wrote till bed. No letter from Hugh. Can’t think what he’s doing. Letter from a teacher thanking me for the play in T.W. called A Regular Muddle. That play appeared in Teachers World in October, 1923. As for Hugh, they'd met on Saturday and had a wonderful time together. 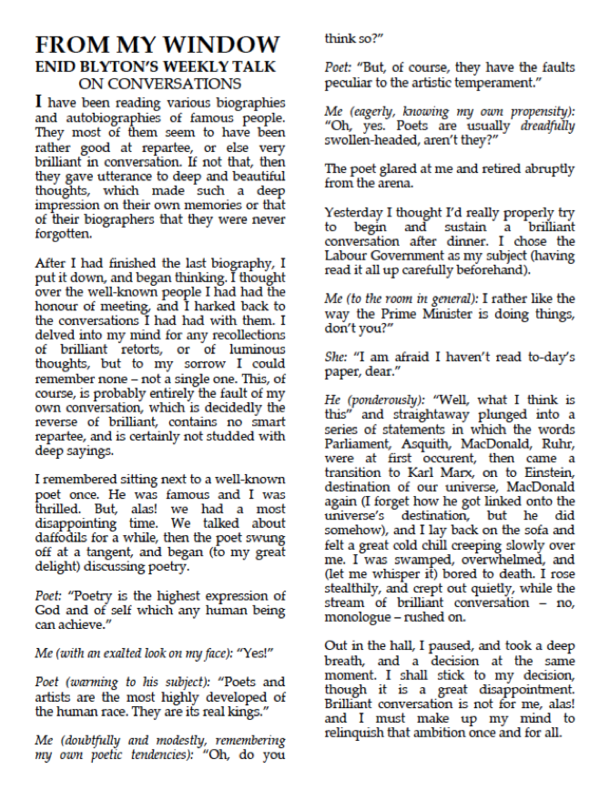 Part of Hugh proving himself was to acknowledge, straight away in writing, the wonderful time he was having! Another six fables today, including 'The Hare and the Tortoise'. Great parallel,between this and 'Brer Rabbit Meets His Match'. In the former, a fast runner gets defeated by a slowcoach because he's over-confident and abuses his ability (taking a nap in the middle of the race). In the latter, the fast runner is tricked by the slowcoach who is no slouch in the brain department (getting the rest of his family to stand in for him at various points in the race). Phoned Hugh at 11.15. He’s been ill in bed with flu again & he sounds rotten. Painting till 4. Wrote all evening. Hugh phoned at 6.30. I’m going up to see him tomorrow about the zoo book. I’m worried. Worried about Hugh's health? So she should be, in the long term. No worries about the Aesop's Fables book. Another six fables written this day, totalling 3000 words this time. Enid would now take a break from the book for a few days before finishing it off on the 17th of February. School. Went up to Newnes & sat in Hugh’s office making notes for Zoo book till 6. I went out to dinner with him at Rules & we sat talking till 9.30! He told me he loved me & asked if I loved him yet. I said I thought I did just a little. He is such a darling. I had a dear letter from him this a.m. He took me to Waterloo to see me home. 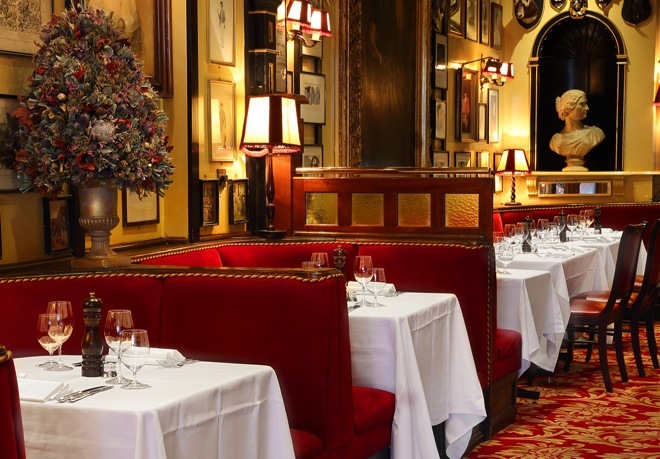 That's the second mention of Rules in Covent Garden, which is the oldest restaurant in London. I hope Enid didn't allow herself to be seduced by her surroundings. Actually, I can easily pull out a map of Enid and Hugh's movements that day. Enid (taking in a Waterloo sunset): "When I was at school, the headmistress was kind enough to suggest I would set the Thames on fire one day." Hugh: "I'm absolutely sure you will darling. With or without my help." School. Met Phil at 2.45 & we had tea at Corner House. She listened patiently to all my eulogies of Hugh. I got home at 5 & had my hair cut and shampooed. Home at 6.30. Read Punch all p.m. & thought of Hugh. Met Hugh at 10. Went to see the guards being changed at Buckingham Palace. It was fun. Then went up to Haymarket to Fuller’s & had coffee & talked. Had lunch there too. Then we went to see the Little Minister and loved it. We sat in the 2nd row of the stalls & it was lovely to be with Hugh. Then tea at Cottage Tea Rooms & dinner (with lots of talking of course) at Victoria again. I caught the 10.30 train home. Hugh was very sweet. He does love me tremendously. He’s not going to ask properly for my love until Easter. He has got something to tell me first. I’m going to a Feb. 29 dance with him. He’s going to teach me. The thing that Hugh has to tell Enid is that he is already married. His wife left him while Hugh was serving in the First World War and Hugh had never got round to filing for divorce. That was something he would now do. Wrote all a.m. Wrote to Hugh in afternoon. To Chapel in p.m. Read till bed. As usual, on Sunday morning Enid wrote her Weekly Talk for Teachers World. It could have been the changing of the guards or Barrie's The Little Minister. Instead it's something a bit more abstract and ambitious. It was Phil who Enid had met on Friday. 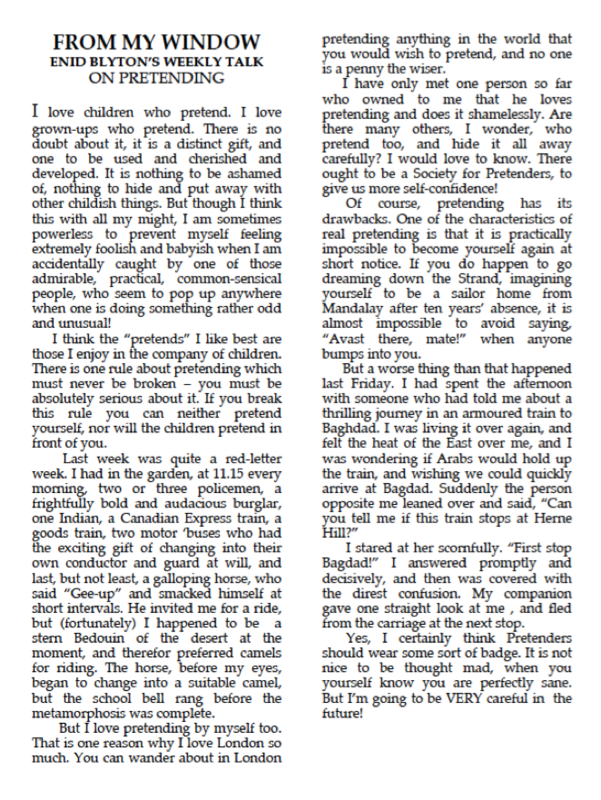 Could Phil have told her friend about a thrilling journey in an armoured train to Baghdad? Sounds more like a Hugh Pollock story to me. After all, he'd been in the army in India and Burma, which would have entailed travelling all over the East by train and boat. Would Hugh have been the other great pretender that she knew, apart from herself? That might partly explain why she was so taken by him. Enid refers to her own territory twice in the piece. First, to The Strand, which she'd walked down on Thursday and may have done again on Friday and Saturday. And the station stops home from Victoria were first Brixton and then Herne Hill. After that the train stopped at West Dulwich, Sydenham, Penge East, Kent House and Beckenham Junction. And after that? Only then, would one have heard a station guard shout, "Next stop, Baghad!" As for having had a red-letter week. Well, Enid had had letters from Hugh and had heard his declaration that he loved her. That's not bad going, as the actress said to the Bedouin. Taken together, these last two Talks say a lot about Enid's understanding of her own character. She wasn't going to stand around in company and talk politics; she preferred to let her mind wander. Solitary, not sociable. Imaginative, not sensible. That's how Enid understood herself. To Surbiton. School. May is back again. Mollie’s music till 4. Went to Wilfrid’s birthday party till 6.30. Hugh phoned me up. Wrote till bed. Finished Aesop’s Fable Book. 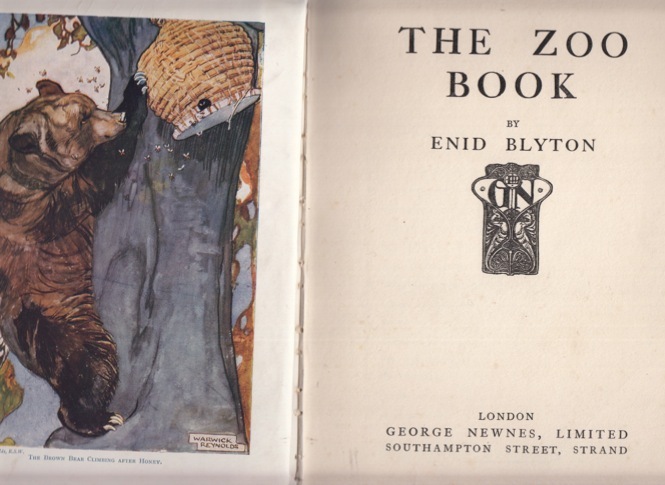 Yes, Enid's work log confirms that Enid wrote the last four Aesop's Fables as well as an introduction to that book for Thomas Nelson. A total of 1870 words this Monday, despite it being a busy school day. I expect the order in which the 22 tales are printed is the same order that Enid wrote them in. 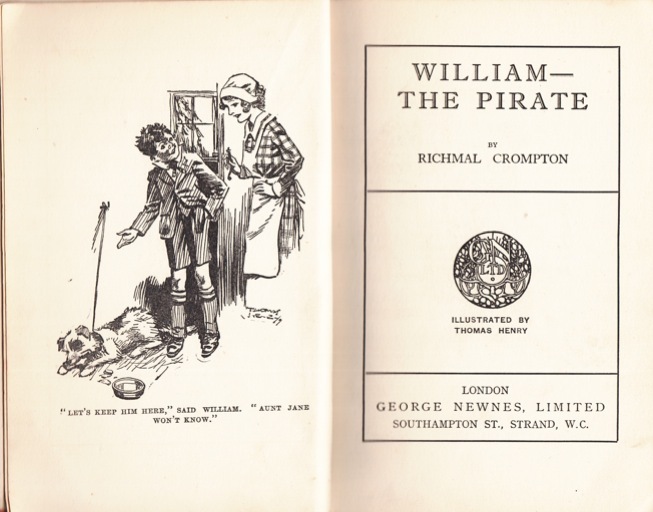 What I know is that the order they appeared in back in Nelson's Reader in 1925 is the same order that they were reprinted in 1999 by Element Children's Books. For me, these stories don't have anything like the complexity, charm and interest of the Brer Rabbit ones. And that's mostly because the characterisation is bordering on non-existent and the 'morality tale' dimension over-emphasised. Of course, it's the Brer Rabbit scenario that got under Enid's skin. She never stopped writing about Brer Rabbit, Brer Fox, Brer Terrapin and co.
School. Handwork till 4. Went down to Kingston & bought a ripping new attaché case & other things. Home at 6.30. Wrote to Hugh all evening. I had his first real love-letter today. It’s lovely & it’s so beautifully written. It would be nice to see it. Even nicer to see the letters that Enid was sending to Hugh. But that would be too much to hope for. Besides, have we readers in 2018 not been handed down riches enough? School. May in quarantine again for measles so not here! Painting till 4. Wrote letters. Went to see “Pirates of Penzance” at Kingston with U.H., A.G. & Margaret Jewson who is staying here. It was lovely. U.H. and A.G were Uncle Horace and Aunt Gertrude, aka Mr and Mrs Thompson. There is an interesting sentence written in Enid's work log. She says, in respect of Feb 19 - 23: 'Sorting out and writing about the right to republish 7 stories for Nelson's'. I think this is a note about the copyright of her own stories. But I'm not sure which of two Nelson's books she's talking about. Tony Summerfield's entry in the Cave of Books on the Enid Blyton Society website helps. Pinkity’s Pranks and Other Nature Fairy Tales, consists of six stories. These were all first published in Leicester Advertiser, Merry Moments or Teachers World. Pinkity’s Pranks is the third Nelson reader, the one after the rewritten Brer Rabbit tales and Aesop's fables, so that matches. (How wonderful for young Enid, to have her own stories printed as part of a series that included world classics.) But only six stories are involved. So the note may be about Tarrydidle Town, a later Nelson Reader. But although that book does contain seven stories, they were all first published in Merry Moments, so only one permission letter would have been required. Also, as that book was the eleventh Nelson Reader, it didn't come out until 1926. 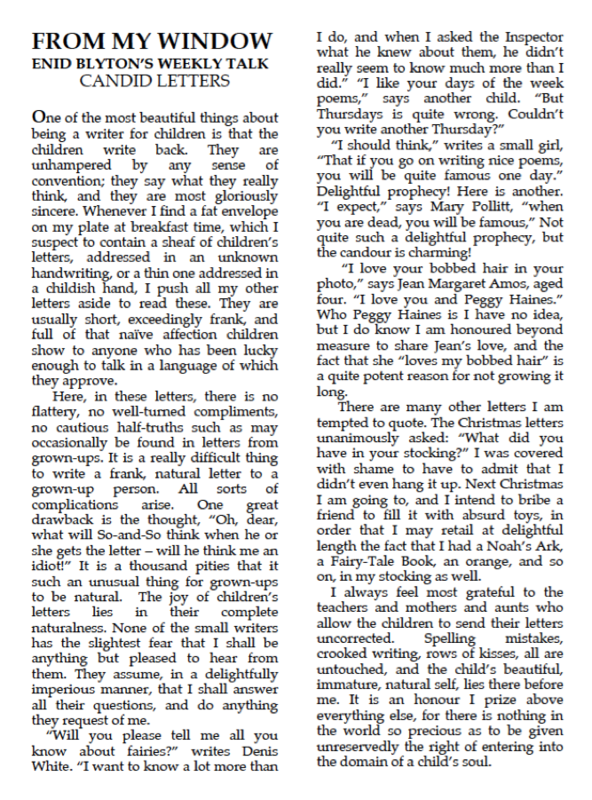 So I conclude that Enid's been writing to The Leicester Adverrtiser, Merry Moments, and Teachers World in order to get permission to republish fairy tales in Pinkity's Pranks. School. Went to Mill Hill in car with John, U.H., A.G., Margaret to see the Prince of Wales open the new Science Building. He looks such a dear – a bit Hugh’s type really. We went round the school with David. It’s lovely. Home at 7. I had a glorious love letter from Hugh this morning. Such a lovely, lovely one. He is a lovely lover. Part of me wants to draw attention to Enid's overuse of the words love and lovely. Another part of me appreciates the genuineness of her naive feelings. She's experiencing a largely outdated notion of the word 'love', one that was the norm in far more innocent times than ours. School. Phil met me at 2.30 & we went shopping. We got a lovely silver tissue evening frock for me and a grey velvet cloak & shoes & stockings to match. I look lovely in them! We had tea at Corner House & I went home with Phil to supper & tried on all the things for Felix to see & he loved them. He gave me a lesson in dancing. I got home at 10.15. Felix was the name of Phyllis Chase's husband. The silver dress and the dancing lessons are towards the dance on February 29 that Hugh has invited Enid to. Just a week to go, Enid. But I expect you'll be seeing him before then! Met Hugh at 10 at Victoria. We went to Newnes & talked & Hugh showed me the stories he’d done, & they were very good. We walked in the sun by the river till 12.45 & then went to have lunch & stayed talking over it till 3.30! But we didn’t know the time at all. Hugh made me say I loved him & he gave me first of all “6 incontrovertible reasons” to prove that whatever I might say I did love him. He’s such a dear. We went to the Tivoli to the pictures & I loved them. We had tea first at the Strand Palace. Then we taxied to Victoria & Hugh took me in his strong arms & kissed my hair ever so for the first time. We had dinner at Victoria & I caught the 10.30 train. It was a lovely, lovely day. I do love dear, lovely Hugh. I don't know what stories of Hugh's Enid is referring to. Stories that he was in the middle of getting into book form, perhaps. After all, his job was books editor. 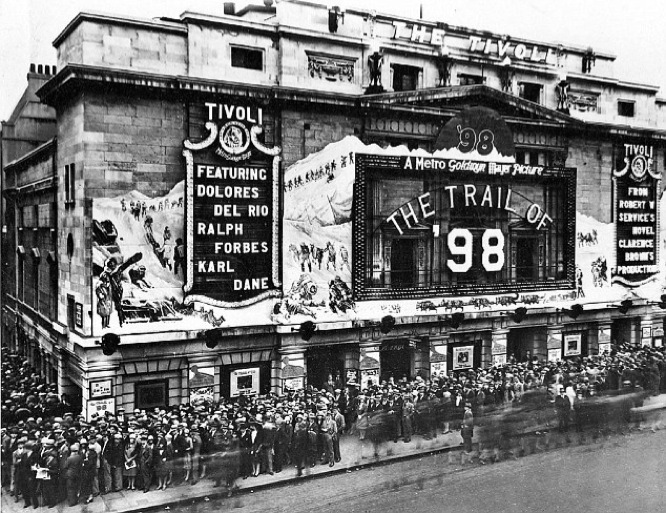 Below is a picture of The Tivoli, which was a grand cinema on the south side of the Strand as marked on the previous map. The photo is from 1928, so it's nearly contemporary with Enid and Hugh's early cinema-going. Hundreds of people queuing for The Trail of '98. Horse-drawn carriages are passing by in a blur of speed. Or is that just people walking? Anyway, the 1924 diary mentions this cinema on several occasions. Wrote all a.m. Wrote to Hugh all afternoon. Messed about with various things till bed. I think that there is maybe a bit of a metaphor going on there. Most springs, Enid would be getting her kicks out of nature. But this year, with the arrival of Hugh, it’s when she goes into town that she feels most alive. 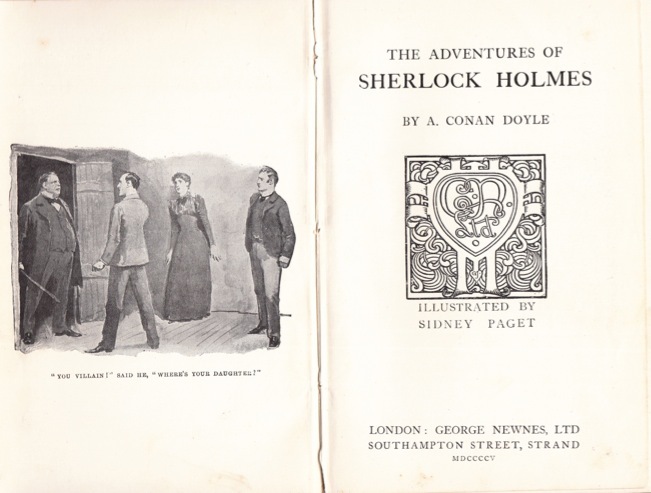 After writing that on Sunday morning, Enid wrote to Hugh in the afternoon. And if she had any sense she ended the letter with the words 'the merry, unspoilt fascination of laughing lovers'. To Surbiton. School. May has now got measles. Found a letter from Hugh awaiting me. Mollie’s music till 4. Took John to dentist & was with him whilst he had gas. Came home. Hugh phoned me at 6 & sounded rather depressed. He’s going to write me every day & wants me to, too. Wrote letter till bed. Unusually, Enid wrote nothing this week. Nothing between Spring Flowers, written on Sunday Feb 24 and the next Talk written on Monday, March 3.Presumably because she was writing long letters to Hugh, as per his instructions. School. V.B.F. came down at 12 & heard the children sing. We went down into Surbiton to lunch & talked till 2.30. Then she came back to handwork and stayed to tea. I wrote letters till bed. Hugh phoned me at 7. He’s alright again. I had a lovely letter from him this a.m.
School. Painting. Hugh phoned at 6.15 & said he must see me. So I met him at Waterloo at 8 & we went to the Strand Hotel. He told me that unless I could give him my real love we must say goodbye after Friday. Dear old Hugh. [something illegible crossed out]. So I told him I did love him of course. We talked till 11, & he kissed me for the first time in the taxi. And yesterday night he gave me all his D.S.O. & medal miniatures, all new beribboned & polished up. The D.S.O. is the Distinguished Service Order. Hugh had an excellent war record and had been decorated for his resourcefulness and bravery. But what had made Hugh so agitated that morning? Perhaps he'd seen Enid's portrait in the new Teachers World. A small photo placed in the middle of a sea of serious notes about education. 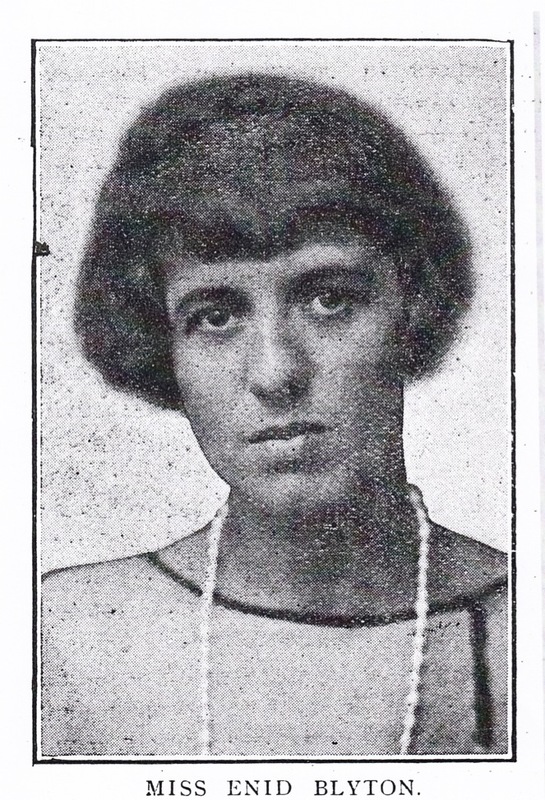 The portrait is one that was taken in 1923, I use it on the intro page to ENID, 1924. 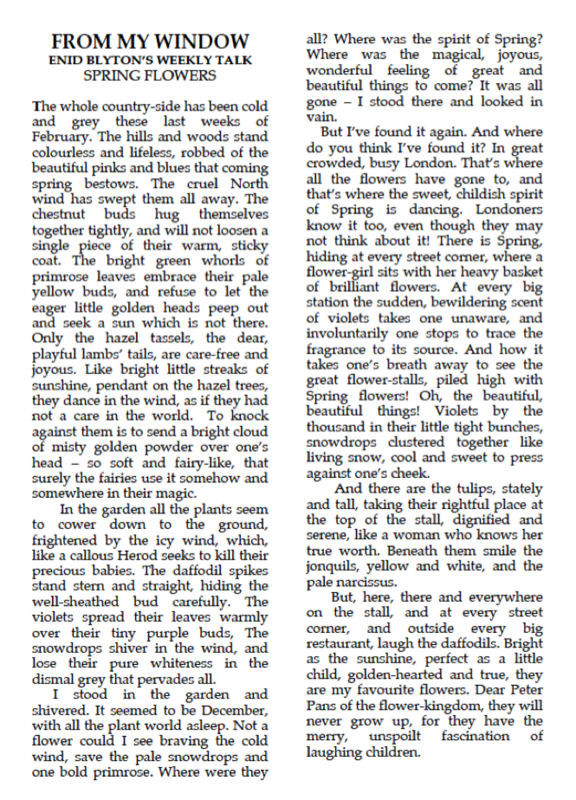 But here it is yet again, extracting as much detail as possible from the newsprint. No wonder Hugh was agitated. What depth in those eyes! School today. Mollie’s music. I got a letter from Hugh, expressed, so I got it at 2.15. He is a darling. He phoned me at 6.30. I wrote letters all p.m. washed my hair & went to bed early, for I’m very tired. Enid washed her hair on Thursday night because Friday was the day of the ball! A lovely day! The weather was awful but it has all been lovely. School all a.m. Home at 3. I changed into my silver dress & shoes & cloak & met Hugh at Charing X at 6.30. We went to Prince’s for dinner & as it was Leap Year Night, it was surprise night & the lights kept going out & dancers & singers came – I danced for the 1st time with Hugh & he said I danced well. It was such fun. I loved it & loved it. Hugh looked so fine in evening dress. He was so very very nice to me. I got home at 1.15. I had to walk up, there wasn’t a cab, but it was quite dry. Great stuff. First, let's say something about the travel. Enid started the day at school in Surbition. Back to Beckenham by 3pm via central London. Then back into central London to meet Hugh at Charing X at 6.30. Then dinner and dance and back out to Beckenham. I guess the trains were still running after midnight and that when Enid says she had to walk, it would only be from Beckenham Junction station. Thinking still about Enid in her silver dress and grey cloak, how about the image below, a cover from Teachers World later in the year? 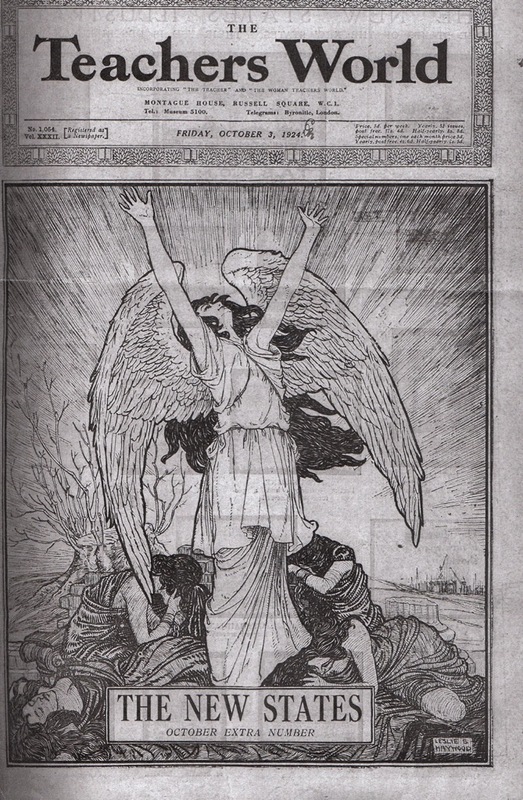 Forgive the poor quality of the copy, it comes from a large bound volume of Teachers World held at the Mitchell Library, Glasgow, whereas the page with Enid's photo in it is from a loose copy of the journal held at the Bodleian Library, Oxford. What is the new Enid shouting to the heavens? "Why have I been depicted with such long hair. My diary states clearly that I had my hair cut at home on February 15." And that's it. But never mind, because March comes in like a lion.